Children has such powerful minds. They are at a time where they are most moldable. And it is so imperative that we help them during this time. To reinforce good mental and physical qualities and beliefs. 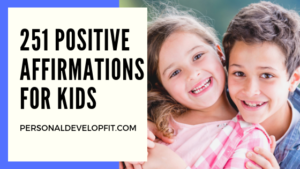 That is why I created this list of affirmations for kids. To help us help them in a way that they get the best start in life. To help them create a confident and powerful mind. Which helps them love and respect their body more. They’re friends and family more. To excel in every level of their life. And grow into a strong and resilient adult who is capable of accomplishing any goal or dream that they set out to do. To insure that the kids of this next generation go on to do great things. Things that they can be proud of. And rest at night knowing they are capable of doing anything. 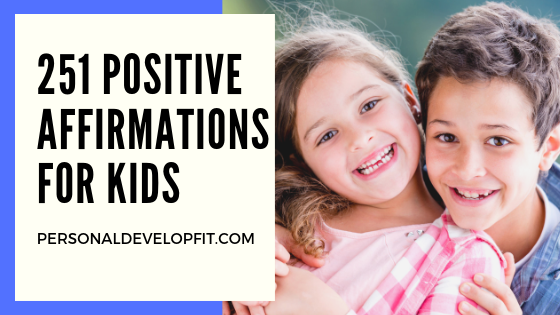 Here is a list of affirmations for children that you can share with your kids. Or even write them down on 3×5 cards and have them carry them around with them in their backpack! Or you can even tape them on their lunch box to remind them to affirm these powerful and positive terms each day. Helping our little ones get into a good routine each day. Even having your kids cut out pictures and tape the pictures next to the affirmations. So they can have nice visuals as many children learn best with picture. I know it also helps to affirm good things right when you wake up. Our minds are very open to stimuli as soon as we wake up. So a good idea is to encourage your kids to recite a few of their favorites as soon as they get up. Even in the mirror or at breakfast. I hope you and your children get value from this list! I am confident about myself and my abilities. I feel so loved by may family. I have the best and most positive friends. I trust that I will do good in school and in life. I love learning new things in and out of school. I love my family and love helping them with things. I accept my body as it is changing and growing. I forgive people who are mean to me. I always use my words to communicate during arguments. I love my friends and family and love to show them that I do. I respect my teacher and love learning from him/her. My mind is strong and powerful. I am so naturally gifted. My dreams are possible to achieve. I can share the truth with my parents and teachers about my life. I am always honest. Honest is the best policy. I wake up each day with energy and happiness. All my problems have perfect solutions. I never try to act or be like anyone else because I love myself just the way I am. I have an awesome sense of humor and love to make my friends laugh. I have a really good attitude. I care about others and love to show my kindness. Every new thing I try I do really good at. I am blessed and God keeps me safe and secure. I respect all my friends, teachers and family. I love try and learning new things in and out of school. I am very helpful around the house. I sleep very soundly helping me have more energy in the day. I stay calm in stressful situations. I love my life so much. I am becoming a better me every single day. I am so smart and intelligent. I discover new talents that I have all the time. It feels great to be a child of God. I can let go of worries I have anytime I want to. I have that power. I listen to my parents because I know they want the best for me. I choose how I feel and choose to feel loved and great all the time. I choose good and healthy foods because I love my body. I am in charge of my emotions, no one else. I learn from all of my mistakes. I am thankful that I have such a great teacher. I love hanging out with my family and sharing my love with them. I can make really good choices, and I do. When people say negative things, I don’t care because I love and respect myself. I have really good focusing skills. I am brave and confident. I feel very beautiful/handsome at all times. I love exercising my body and love the way I feel because of it. I always break through my fears. I know I can always do better next tiem. I choose friends who love and support me. I don’t involve myself with people who are negative and unloving. I listen to my internal feelings and voice. I am a good leader. I am open to receiving all the help that I need. I always forgive myself for making mistakes. I am a greater listener for my friends and family. I always keep peoples secrets safe. All is well and perfect in my world. I love my daddy and mommy so much. I see problems as a way to challenge myself and become better. There is always a solution to every problem I have. I am not afraid to ask for help when I need it. I was born to be happy and successful. I try different strategies to find solutions. I love seeing others succeed too. I never compare myself to my friends, family or anyone else. I know my mom and day want the best for me, that is why I listen and learn from them. I love the world and everything in it. I feel so grateful for being alive. I am creative and artistic. I am admired by all my friends and family. I always find something positive in every situations. I believe in my drams. I am a very disciplined person. I always work hard and achieve my goals. I love setting new goals for myself, it feels good! I am tough and resilient. I am a great example to my friends. I always listen to my heart. I believe in my goals and dreams even if some tells me it is not possible. I am very gentle with myself and others. I have such a powerful imagination. I only let myself have happy and positive thoughts. My friends and family love and support me for who I am. I am growing up perfectly. I am going to make a great adult! Miracles and blessings show up in my life often. I always feel full of energy. I have hope for a really good future. I always have solutions to my problems. I find learning things to be so fun and exciting. I learn new things quickly when they are taught to me. My body is healthy and growing up strong. I never am afraid to ask questions for that is how I learn best. I trust myself to make the best decisions at all times. I love just being with myself and enjoying my own company. I can visualize really good. I always share my fears and worries with mom and dad because they want to help. I am and feel protected by God at all times. I am thankful for all the good things that are happening in my life. I see and experience beauty wherever I go. I love smiling and laughing and do so a lot. I love nature and animals and treat them kindly. I am really good at time management. I always get my homework done right when I get home. I am worth of happiness and peace in my life. I feel guided by God and my intuition. I have really happy thoughts. I get great results in the things I try. Everything works out really good for me. I am inspired by my idols and know I can live my dreams too. I am excited about all of life’s possibilities. I love giving and receiving compliments. I play well with friends. I save money very well to buy things I want and save for my future. I am great a all subjects in school. I enjoy being very punctual. I have no fear about speaking in front others. I am always on time for classes. I love exercising my body at recess. I enjoy eating vegetables for I know they will help me grow up strong and healthy. I find my natural talents easily. I build on my talents and gifts for I know they were given to me and special for me. I seek to make good friends, not be popular. I trust my parents advice for I know they want the best for me. I speak my opinion and say what is on my heart and mind. All my senses work perfectly. I am a true inspiration to myself and others. I believe in myself more and more each day. I love feeling loved by all my friends and family. I respect my teacher and am thankful for them. I have a big purpose for my life. I always speak in a kind manner. My needs and wants matter. I am OK with sharing how I feel and knowing I won’t be judged for it. I choose my attitude and it is always good and optimistic. I look forward to new grades and learning new things. I have no fear about my future for I know it is blessed. I am a great kid. My parents thank God that they have me. I always have really good ideas. Life loves bringing me joy and laughter. My parents believe in me. My friends see me as their best friend. God is bigger than all my worries. I am adored by my friends, family and teacher. I always get really good grades. If I fall, I will get right back up! I can’t wait to wake up in the morning because of all the possibilities the day holds. I can always do better next time. I give myself permission to make choices and they are always good choices. I have so much inner beauty. I live in the moment for I feel best here. I always push through and persevere through tough times. I allow myself to work at my own pace. I am not afraid of taking chances. I love and embrace the changes that are going on in my life. I learn new languages with ease. I breath in positivity and exhale negativity. I see everyday as a fresh start. I deserve to be completely happy. I don’t define myself by my test scores. I am perfectly happy but always striving to be more. I stand up for myself and have the courage to do so. I am a success and going to be successful for all of my life. I only compete with myself not others. I am never jealous or envious of others. I love sharing things with the other kids. I am very mature for my age. I am a grateful for my home and my bed and the neighborhood I live in. I am a cool kid. I expect great things from myself. I always see projects to the end and don’t get distracted. I know that I can become better at anything I put my mind to. I love the image I see when I look in the mirror. I love stretching my body and mind and finding new limits for myself. I don’t believe in limits or anyone who says I have them. Even when mom or dad are not around, I still make excellent choices. I love to win but when I don’t I know it is OK because I tried my best. I stay hydrated each day because it is good for my body and makes me feel great. I maintain really good hygiene. I know that everything in my life is happening to help me become happier and better. I love using technology to learn and grow. So there you are, to all the great parents out there who want the best for their children. A list of positive and empowering affirmations for kids and young adults. I hope you found value in this list and found good and positive ones to integrate into your kids life. You child has greatness in them. And I know that in my heart of hearts, that with this list, you can help them bring out that greatness. And have them become more confident, passionate and driven. I hope you and your child can use this list of affirmations for many days to come!